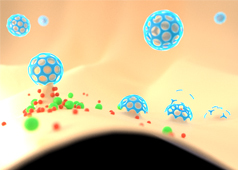 Nucleation Promoting Factors (NPFs) (e.g. WASP, Scar/WAVE) modulate actin filament nucleation by bringing together actin monomers and pre-existing actin filaments, for example, during filopodial initiation where they recruit the Arp2/3 complex. NPFs compete with profilin for binding to free actin (which inhibits actin nucleotide exchange) ; these combined functions promote actin-filament assembly at the barbed end. The molecular organization of Scar/WAVE family members and WASP, with examples of how the NPFs are represented in figures throughout this resource. Relevant domains believed to be important for binding to actin and for protein-protein interactions are highlighted (reviewed in [2, 13]). WHD= WAVE (also known as SCAR)-homology domain; WIP= WASP-interacting protein; V= verprolin-homology domain (i.e. WASP-homology-2 domain [WH2]); C= cofilin-homology domain; A= acidic-rich domain; WH1= WASP-homology-1 (aka Ena-VASP-homology-1 [EVH1]); GBD= GTPase binding domain. Of note: N-WASP contains an additional V domain, and the Scar/WAVE proteins lack a direct binding domain for the Rho GTPase family. 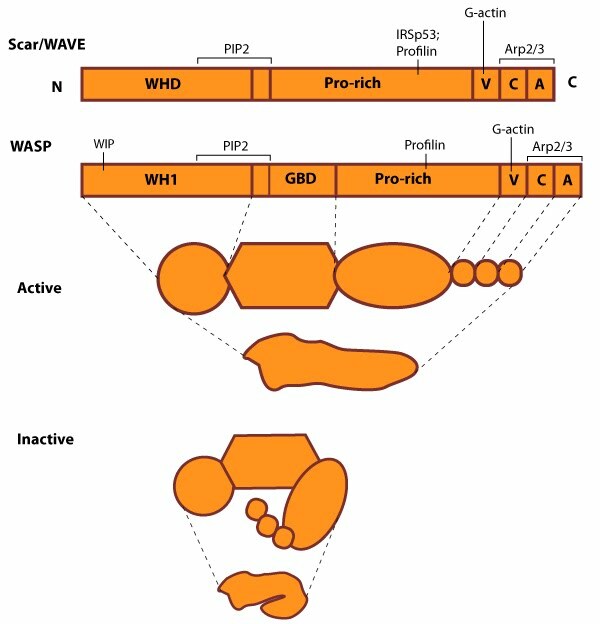 The conserved verpolin-cofilin-homology and acidic-rich (VCA) domain at the carboxy terminus of WASP and Scar family members binds directly to the Arp2/3 complex to increase its nucleation activity . WASp also associates with other signaling components (e.g. 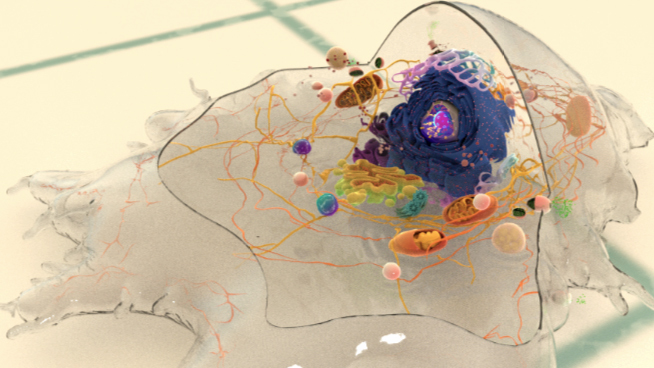 haemopoietic cell kinase) and formins to modulate actin polymerization for cell polarization and chemotaxis in neutrophils . WASp and formins also cooperate to control the balance between lamellipodial protrusion activity in epithelial cells . The WASP family of NPFs are normally auto-inhibited due to protein interactions which prevent the NPF from associating with actin and the Arp2/3 complex; they are activated by *Rho GTPases and PIP2  (reviewed in ). In contrast, the Scar/WAVE proteins have constitutive activity . NPF accessory proteins also modulate the activity of NPFs. Examples of NPF accessory proteins include Verprolin (yeast), which modulates the activity of WASp with type I myosins, to promote actin assembly by Arp2/3 complex . WASp-interacting proteins (WIPs) will also regulate the WASp activity. For example WIP  not only inhibits N-WASP, but also promotes nucleation and activation of the [Arp2/3 complex through the coordinated binding of actin and another NPF, cortactin . SPIN90/WISH (SH3 protein interacting with Nck, 90 kDa/WASP-interacting SH3 protein) ) on the other hand increases actin assembly in dendritic filopodia/spines independently of N-WASP through its association with the neuron-specific scaffolding protein, PSD-95. Surprisingly, indirect evidence shows that WIPs are required for WASp function . In another example, the WAVE complex will inhibit Scar/WAVE proteins from activating the Arp2/3 complex. The NPF activity of Scar/WAVE is restored during nucleation when Rac-GTP causes the dissociation of the WAVE complex from WAVE1 . Similarly, IRSp53 has been implicated in both lamellipodia and filopodia formation/protrusion by augmenting the Rac-GTP-induced activation of WAVE NPF activity . This schematic diagram illustrates the molecular organization of Ena/VASP. 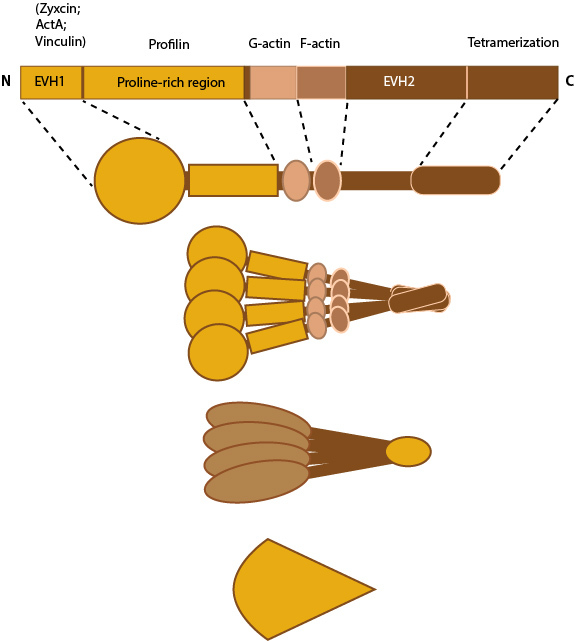 Proteins of the Ena/VASP family contribute to cell movement, axon guidance, neural tube closure and shape change in vertebrate cells by modulating actin filament organization and dynamics; these effects are achieved in part by regulating the morphology and behavior of actin-based structures such as lamellipodia and filopodia (reviewed in ). 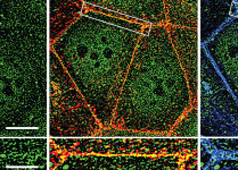 Ena/VASP proteins also modulate actin dynamics at sites of cell-ECM and cell-cell interactions and they are concentrated to the proximal portion of phosphotyrosine-rich domains at the ends of F-actin stress fibers . Ena/VASP proteins promote actin filament elongation by tethering actin filaments to sites of active actin assembly . Ena/VASP proteins recruit actin nucleation and initiation factors (e.g. Arp2/3 complex, formins) and promote F-actin assembly through profilin-binding (reviewed in ). The rate of Ena/VASP assisted actin filament elongation is determined by the recruitment of G-actin. This will occur via a G-actin binding site (GAB) that lies within the EVH2 domain and shares close sequence homology to WASP homology 2 motifs . Ena/VASP proteins are also thought to accumulate at the plasma membrane where they alter actin polymerization by antagonizing the barbed (+) end capping proteins, thereby enabling the incorporation of actin into longer filaments ; however, controversy over their exact mechanism still exists (reviewed in ). 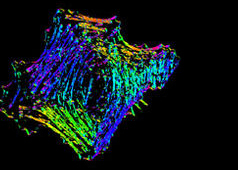 In addition, Ena/VASP may promote actin assembly by an unknown mechanism that is independent of initiation factors, however, this has not been demonstrated in intact cells .